Welcome to the world of Rinto! Visit other regions from your favorite generations! We are proud to report the current lack of any bugs. You are a young person living in Goldenrod City. To be a Pokémon Trainer has always been your dream, and now it's FINALLY going to come true on your tenth birthday. A new professor, Professor G. Oak, set up his lab in a far-away place called Lake Zigger. Your mom is finally letting you get your first Pokémon, a choice between three Fire-type Pokémon, so you get on a boat and head to Lake Zigger. Once you get there, however, there are a few problems... You're late, a lost passenger and a package at the Pokémon Mart delay your arrival at the lab even further, and you have no idea how to get there in the first place! As you finally make it into the lab, you go down the stairs. Suddenly, some kid comes in to get HIS Pokémon an entire day early! Somebody else had arrived before you and taken the Charmander, and then this new kid steals away Cyndaquil! Torchic is the only Pokémon left now, so you go and take it. Suddenly, the kid challenges you to a battle, after which you proceed to leave town. Suddenly, there's a FLASH and your Torchic's been replaced by some unknown Pokémon, but, seeming as the Professor ran out of the lab right past you, you have to continue. As you leave Lake Zigger, you encounter somebody from an organization you'd never heard of. Presumably, he was sent to Lake Zigger to steal that strange Pokémon you had, but he runs away after he gets beaten. You didn't know that the evil team will do anything to get that Pokémon, including some very un-evil-team-ish things. Not only this, there are many more things that will sidetrack you from your Rinto Pokémon League quest than just a bunch of crazy people. The ability to have many Secret Bases, insane twists in the plot that even I didn't expect, cameo appearances by random people, saving the real world from a catastrophe (as well as the Pokémon world, obviously), some odd times when you just aren't yourself, and realizing the importance of the number 42 are a few of the crazy things that happen to you on your journey throughout the region of Rinto. We worked hard on this! The early bird gets the worm. Or, in this case, the Pokémon. Same person - excuse me, hooligan - as in the intro. The GSC-styled Pokémon Center, minus the upstairs. Noob? Who are you calling noob, noob? I exit Vantrek Pass and this nice old man offers to take me to the Pokémon center. Last edited by Diegoisawesome; 27th July 2014 at 07:38 AM. I think I played one of the old betas and I truly enjoyed it! Gangsta granny all the way! Good job, very good. 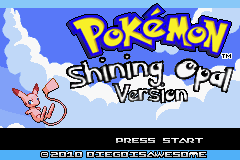 I really like the Mikachu and the Oak Intro. Best of luck, I'm looking forward for more updates.